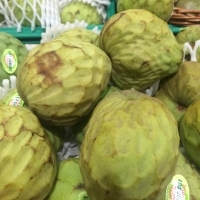 Its possible that no known fruit compares to the delicious taste of the cherimoya. 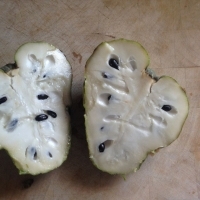 The white flesh is luscious, soft and sweet and is described by many as having the flavour of Mango, pawpaw, bananas and coconut. They're absolutely delicious when devoured icy-cold from the freezer and eaten like ice-cream. A large evergreen tree with flowers and a scent just like the fruit tastes. 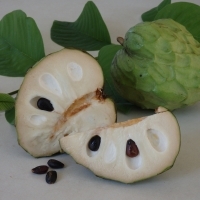 Very closely related and similar in appearance to the custard apple. Cropping as far south as Melbourne.